Movies that have multiple titles = terrible, terrible films. Avoid at all costs. Not recommended. This movie started out very slowly and walked the line of us turning it off the whole time. Some late gore and almost-recognizable actors attempted to redeem it, but no luck. As mentioned in ‘what we learned’, if we can’t even find the movie on IMDB because they have retitled it, it’s probably for a reason (the producers are trying to cover their tracks). Starring: Carrie Fisher, Al from Quantum Leap, and a bunch of Englishmen. In the distant future, the human race nears extinction. Only the hardiest of people, Australians, have survived. They live in a city that can apparently travel through time, propelled by the shear power of Al from Quantum Leap’s acting prowess. Pursuing them through time are weird cyborg creatures. There is no reason for these cyborg creatures to relentlessly chase them through time and space, only their apparent hatred of all things Aussie. You can pull guns out of broken time spheres – but there is a cost. Aborigines are in touch with time guardians. There’s some kind of connection between the confederate south and Australia. Lawmen in Australia are the most evil, corrupt people in the country. Time Travelling cities need a flat piece of land to warp to. Prairies or other naturally flat landscapes do not work. They must flatten the land by hand and with earth movers. Australia is a hotspot for time travelers. What do you get when you cross Star Wars, Star Trek, Terminator, Mad Max, and Quantum Leap? Kind of a mess. This movie was mildly entertaining at times, but mostly hard to follow. There’s no explanation for why these cyborgs are trying to chase this city through time. If they have all of time and space at their command, isn’t there room enough for the both of them? Not according to the cyborgs. Also, the leading actors in the movie, Al from Quantum Leap and Carrie Fisher, have probably 10 minutes of screen time. That’s a big red flag. All in all, it’s probably not worth going out your way to see. Plot: A deadly biological agent is released into a national park because an inept truck driver crashes. The Boz, playing the Presidential head of security, must rescue everyone using the power of football. The Boz never could and never will be able to act. This movie was boring…. so boring. Brian Bosworth plays himself, where instead of being a star college football player turned washed up actor, he is a star college football star turned head of secret service! He meets a cowgirl with whom he has no absolutely no chemistry. Luckily they are able to save the day together because they have a mild form of the common cold which renders them immume to a biological agent that is otherwise capable of killing within seconds. An evil wing of the goverment will stop at nothing to cover up the spill- even if it means the head of the group wandering around in the wild shooting grenades at the Boz. Sound entertaining? It’s not. 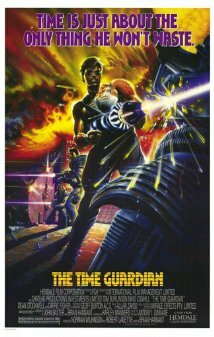 There are about 45 minutes in the middle of this movie where the Boz and his crew are wandering around and absoutely nothing happens. They have some meaningless dialogue. Evil Park Rangers jump them. It’s all terrible. When a freak hurricane swamps Los Angeles, nature’s deadliest killer rules sea, land, and air as thousands of sharks terrorize the waterlogged populace (from IMDB.com). Sharks can travel through drains and sewers- really they can appear out of nowhere. Movie car rental places stay open during the worst storm in California’s history. These rental cars have real nitro boosters included! You can survive in a shark’s stomach for an extended amount of time. Sharks have the accuracy of a tomahawk missile when airborne and always fly teeth-first. We actually watched a few minutes of Sharknado during the world premier on SyFy, but had no idea that it would become the big deal that it did, so we had to schedule the next Thursday for a viewing. Did Sharknado live up to all the expectations? Did it deserve all the press? Yes and no. This movie did truly hit a homerun as far as casting, and overall absurdity. It really had everything that we love here on BMT: washed up actors, horrible dialogue, bad special effects… So what’s not to like. Maybe it’s just me personally, but I can smell a SyFy Channel movie a mile a way, and even though this might be the cream of the crop, it still is a little off-putting. Something about the video quality, pacing, and how the CGI is cut into the scenes with the actors… But somehow it doesn’t completely feel like a real movie for me- more like a tv mini series or a Stargate spinoff. Once past the SyFy hang-ups, this movie was quite entertaining, and had us laughing and engaged the whole time, so it was a win overall. Most of our enjoyment came from trying to come up with a movie to match the absurdity of Sharknado (how many viewers out there did the same?). We settled on “Scorpion Avalanche”- maybe “Scorp-valanche”. We had it casted, the plot set and how the climax was going to play out. I don’t know if any of us remember the details, but still no stealing this idea. Bad guys have partners just like cops that they have for years and care about. Car crashes through camper tops are much cooler than normal. The A-Team van is not only used by the A-Team, but also by washed up convict stuntmen for bank heists. Angie Everhart stopped being hot sometime before 1997. Top secret area “55” is somewhere in Los Angeles. Evil bad guy generals can get off in situations where the movie just needs to end w/o a resolution. Even in a make believe movie, Michael Madsen will get caught with an 18 year old girl and a bag full of blow. 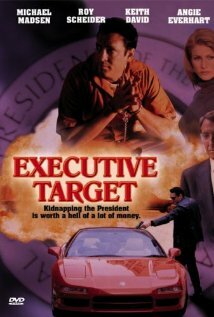 There are some movies that are unforgettable like Star Wars or the Godfather, and there are some movies that you forget immediately after watching them like Captain America or Nottinghill, and then there are a few that you forget while actually watching them like Executive Target. I think we were watching a movie about a bank heist? And then there’s Roy Scheider schlubbing as a do gooder President and an evil general? Is this the same movie? I think I missed something when I reached for another beer. This movie sports an impressive budget and a number of explosions and flying cars, so I really can’t complain that much. I just have no final take and no memory of even watching the movie.